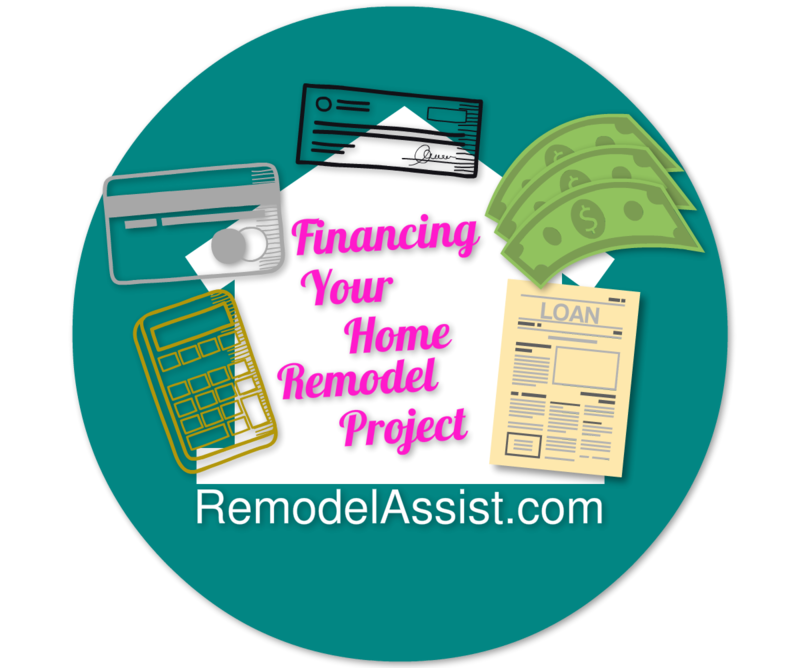 ​What home remodeling financing ​info are you looking for? There are a few decisions to make before moving forward with your home remodeling project. Naturally, one of the decisions involves choosing how you're going to finance it. Of course, it would be ideal if you have enough disposable cash-on-hand, and be able to pay with these funds. But, ​this isn't a realistic choice for many homeowners. Therefore, it becomes necessary to look at the various financing options you have available to you - and choose the one that suits your particular situation. According to financial experts, the following are the top options for home remodel financing, kitchen remodel financing, bathroom remodel financing, etc. The refinancing of your mortgage is an ideal option for those who haven't refinanced in a while. If you've got significant equity built up in your home, you may choose to look at a cash out mortgage refinance. With a cash-out refinance loan, you refinance ​your existing mortgage loan for a larger amount than your current outstanding balance. You get the difference between the new and old loans, and you can use this amount to pay for your home remodeling project. Adding the expenses on top before refinancing makes it easier to manage. The interest rate will sit somewhere around 3.1-3.5%. It's essential to recognize that the refinancing of your mortgage also entails understanding the term being offered. It doesn't make sense to refinance if the part of your home being remodeled won't last longer than the term of the refi loan. Otherwise, you may find yourself having to continue paying off the previous project when you need to have repair work (or new replacement work) done! This is the last position ​one wants to be in as a property owner because it can become a costly proposition. ​Click here to easily find the home remodeling, home improvement, and mortgage refinancing pros in ​YOUR area. ​A home equity loan is a standard option for those who may be considering a home renovation loan​, and it's one most property owners think about when ​deciding how to pay for the project. The premise is to use your home equity as leverage to get the loan approved. For example, you will put the house as collateral and the lender will offer its rate based on this premise. For those who want a fixed rate, this is the way to go. However, it is important to note your house is being used as collateral, so you have to be certain payments can be made. If not, you will likely lose ​your property. Will your remodeling project be a smaller project? If so, you can go with this financing option and get the funds as soon as you want. ​Although credit cards are readily available, they can hit you hard ​on the interest front. Credit cards come with a high-interest rate, and that should certainly be factored in to your decision. If the remodeling job is a small one, you might consider ​choosing to move forward and pay with one or more of your credit cards. If your project is going to be a mid-size to bigger remodeling endeavor, consider ​looking at the other financing options mentioned in this article. Making one or more sizable payments with your credit card is rarely a good idea. ​If your home remodeling project is priced at less than $25,000, an FHA loan may be the way to go. You are going to get a competitive rate because this loan is backed by the US government. Therefore, the lender isn't taking a massive risk on it as they will be paid back one way or another. The FHA loan is an ideal place to look because you're going to find a fair deal. These loans can even be approved for those who don't have viable equity in the home. ​Note that an FHA loan will be approved for a set term that can go up to 20 years. ​A Home Equity Line of Credit (HELOC) is ​reliant on your credit report, your current standing with other loans, and obviously, the amount of equity you have in your home. If your mortgage isn't in good shape, it is best to avoid this option because the interest rate will be insufficient. If your mortgage is in good shape, this is an exciting option and may be the way to go. Banks are often willing to give reasonable interest rates on such loans, as long as your mortgage is in good standing. Note that you may end up putting up your property as collateral when getting a line of credit​ loan. It's best to stay safe and know you will be able to make the payments. ​The final option is a construction loan, but it comes with a set of restrictions. These restrictions are built into the contract to ensure funds are used as listed. For example, if you're approved for the construction loan, it will be released in phases. As you complete a phase of the remodeling process, the money will be released - and this can become frustrating. For those who have a more extensive remodeling project and need funds immediately, this is an option to keep up your sleeve. So, these are the financing options for property owners to take a look at. Home remodeling projects aren't easy, and everyone would love to have enough cash on hand. But, that can be ​difficult to realize. For those who need a viable lending option as soon as possible, these are the six financing strategies that finance experts recommend people to look at. Each financing option has its pros and cons - meaning you have to take the time to ​sift through them & assess them - one by one. I recommend that you list your needs and start thinking about what each financing option brings to the table for your specific situation. This will help ensure you make the right choice. Before jumping into financing options for a home remodeling project, it's best to familiarize yourself with realistic home remodeling costs for your area.